Both the ARC (Australian Research Council) and NHMRC (National Health and Medical Research Council) policies state they: “… requires that any publications arising from an [ARC/NHMRC] supported research project must be deposited into an open access institutional repository within a twelve (12) month period from the date of publication”. The Flinders Academic Commons (FAC) is the University’s open access institutional repository. Deposit of your publication in the FAC satisfies ARC and NHMRC requirements at no cost to Flinders researchers. Please contact eResearch@Flinders for assistance. Not sure if you need to comply? This flowchart may help. The Chief Investigator A (CIA) on any given grant will be responsible for providing the publication metadata (ie – journal name, title, author list, volume, issue, page numbers etc) and, as and when it becomes available, the appropriate copy of the publication to the institutional repository. This is independent of the CIA’s authorship role (first, last or middle) on a given paper. Articles need to be in the FAC within 12 months from the date of publication. However, publication metadata should be submitted as soon as possible after the paper is accepted for publication. Both the author’s version of the article (Word document) after peer-review, with revisions having been made and the publisher’s version (e.g. journal version with final pagination and formatting) are acceptable under this revised policy. Journals may have different policies regarding what version of a manuscript or article can be made available, and timing of this availability. This information should be included in any copyright/licensing agreement. FAC staff will check publishers’ copyright agreements and advise on the appropriate version to deposit. For articles already available openly, for example by payment of an Article Processing Charge (APC), the metadata (citation information) still needs to be deposited to the FAC, including corresponding grant number/s. We will then add a link to the open access paper. This is to allow monitoring of what is being made available open access. The above information has been sourced from the NHMRC and ARC websites: revised NHMRC policy on the dissemination of research findings, ARC Open Access Policy. Index & full text. Institutional repository. Showcases the research outputs of Flinders University staff. Contains conference proceedings, books, journals, book chapters, select Australian Book Review articles & Don Dunstan collection. 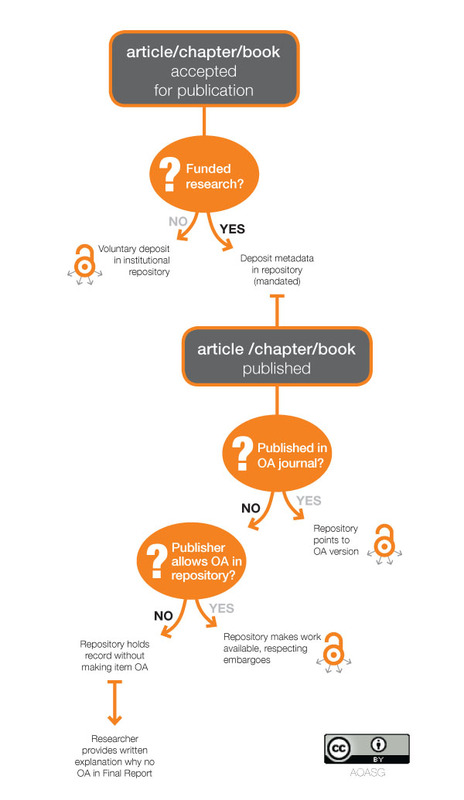 Database for determining publishers' policies for open access.